Do you want to be in a Gourmet Dinner Club? If the answer is yes then I think you should start one. My friends and I fondly refer to our Gourmet Dinner Club simply as Gourmet. We have been meeting since 1988 so have cooked our way around the globe over and over. We have hosted elaborate multi-course dinners, created menus from countries we hadn’t heard of, hosted events and occasionally invited other friends. The ideas are endless so make up your own rules and change them when they no longer work. That’s how we do it. The hardest part of planning our Gourmet Dinner Club night is finding a date. I can’t help you with that. But once you’ve set a date then you need a menu and that’s my specialty. I love to try dishes from around the world and over the years I have collected a lot of great recipes. Many of my East Indian favourites are posted so here is my suggestion for an East Indian Menu. Why A Gourmet Dinner Club? For us the idea is to have fun and try new recipes. That’s it. There is no criteria for elegance and no extra points for presentation (although some of us enjoy that part more than others). We have learned to appreciate the occasional disaster and the story is archived in our minds as “one of those Gourmet Stories”. We have lots of them and retelling each one just adds to the fun. Living with dietary restrictions presents many challenges, especially when dining out. If you are up for a different challenge, cooking with friends and trying new foods, read this post on How To Start A Gourmet Dinner Club. In each recipe description on the website I share tips related to buying, using and cooking with the ingredients in that recipe. For me part of the fun of a Gourmet Dinner Club is discovering ingredients you are not familiar with or challenging yourself to try techniques you have never tried before. This attitude decreases the pressure, be adventurous and don’t worry about every dish turning out perfectly. 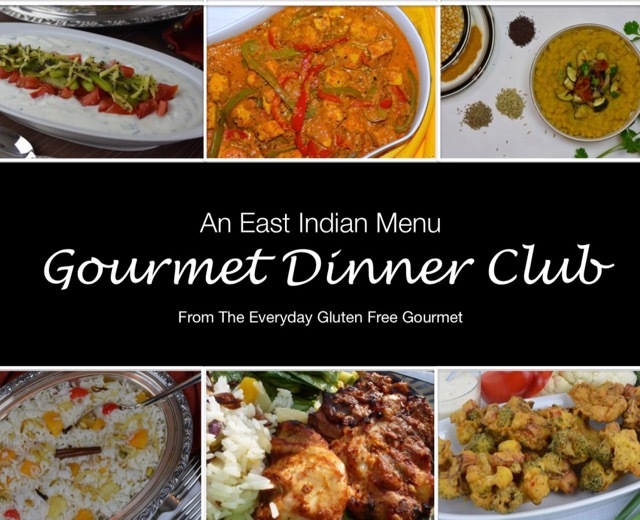 I’d love to hear in the comments below if you hosted a Gourmet Dinner and if you used this East Indian Menu.